This volume examines the role of apologia and apology in response to public attack. Author Keith Michael Hearit provides an introduction to these common components of public life, and considers a diverse list of subjects, from public figures and individuals to corporations and institutions. He explores the motivations and rationales behind apologies, and considers the ethics and legal liabilities of these actions. Hearit provides case studies throughout the volume, with many familiar examples from recent events in the United States, as well as an international apology-making case from Japan. The broad-perspective approach of this volume makes the content relevant and appealing to practitioners and scholars in public relations, business communications, and management. 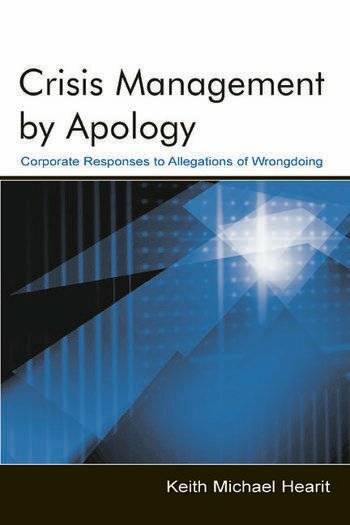 It is a valuable text for courses that take a discursive approach to public relations, and it also appeals to readers in business management, examining apology as a response strategy to corporate crises. Contents: Preface. Introduction. Apologia, Social Drama, and Public Ritual. Legality and Liability. Apologetic Ethics (written with Sandra L. Borden). Apologia and Individuals: Politicians, Sports Figures, and Media Celebrities. Apologia and Organizations: Retail, Manufacturing, and Not-for-Profits. Institutional Apologies: Institutional, Religious, and Governmental. Conclusions: Corporate Apologia, Ideology, and Ethical Responses to Criticism. "This volume, a scholarly treatment of the growing tendency for organizations and public figures to apologize publicly, is a welcome attempt by Hearit to synthesize research from rhetoric, philosophy, management, and psychology. Highly recommended."